The Fellowship was fortunate enough to obtain a copy of GHOSTBUSTERS 35TH ANNIVERSARY: THE REAL GHOSTBUSTERS from IDW Publishing. The story is written by Cavan Scott; with pencils by Marcelo Ferreira, inks by Maria Keane, colors by Luis Antonio Delgado, and lettering by Neil Uyetake. The boys have their hands full with nasty baby ghost, when all of the sudden another group of ghost eliminators calling themselves SPOOKS AWAY come in and finish the job. It gets worse from there as the competition seem to be to be beating our heroes to every job. How are they able to do this? Where did they get those wonderful toys? Will Ghostbusters have to hang up their proton packs for good? The 35th Anniversary of GHOSTBUSTERS continues with this one shot featuring the animated series version of the gang. Cavan Scott delivers a fun little script and captures the voices of the characters perfectly. Marcelo Ferreira invokes the animation style, yet adds his own take. Great job by everyone involved. Honestly would love to see at least a miniseries based off this version of the Ghostbusters. Maybe it will happen. 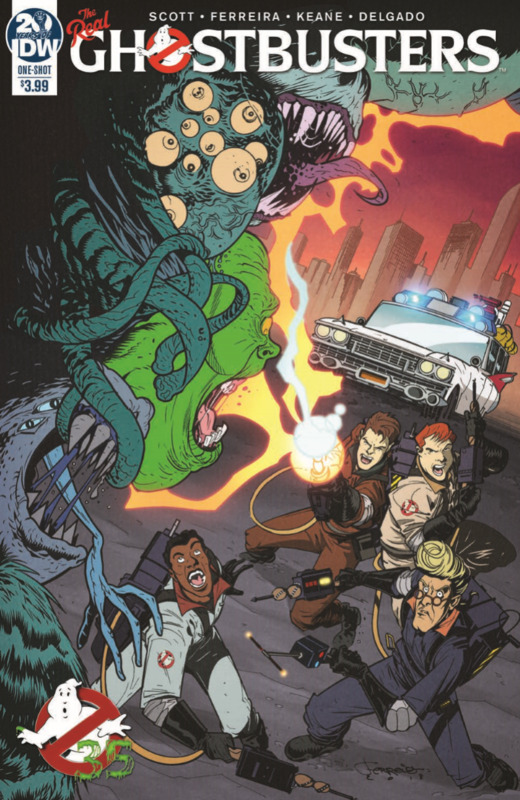 GHOSTBUSTERS 35TH ANNIVERSARY: THE REAL GHOSTBUSTERS is in stores now or available at www.idwpublishing.com.